Thanks to his visions to see education beyond pen and paper, Adinarayan V is very popular with his students. A Computer Science graduate and a professor for over a decade now, he has combined the ancient Indian system of Yoga, stories from Mahabharatha and modern cognitive and behavioral sciences to successfully enhance the attitude of students towards learning. What led you to quit a day job to set up the Anaadi Foundation? It has to do with the fact that I respect students, a lot. I think they have the energy and capability to do wonders in life, if given the right direction. Yoga has helped me get where I am and thus I want to pass this legacy on to the students. After getting enthusiactic response from students of Amrita University, where I taught Cultural Education, I wanted to reach out to more students in the country. Thus, I left my job in June 2015 to set up Anaadi Foundation. What Yoga practices would you recommend for students? Dynamic Yoga sessions are power-packed three hour sessions which have been popular among students. Thus, they are widely offered in schools and colleges that help students learn asanas that make them agile and energetic. 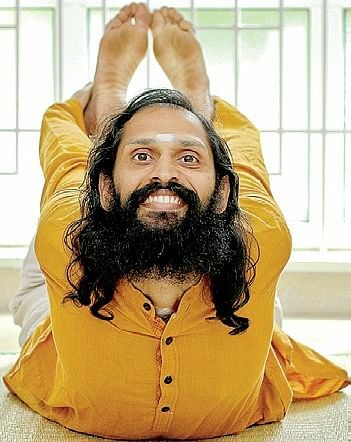 Apart from this, a primer program, called Soukya Yoga, that includes a set of simple asanas, pranayama practices helps the participants feel relaxed, calm and energized. These practices are designed to be suitable for people of all ages. Is the organization only about Yoga or is there more to it? Yoga forms the primary base of the organisation but it is dedicated to the self-unfoldment of youth through its carefully designed programs with science and sprituality as building blocks. The program is designed to have Mahabharatha based teachings which involve the narration of the detailed storylines of the Mahabharatha together with discussions on scientific, social and philosophical aspects. Combined with psychology based activities, it helps participants apply the deep principles of the Mahabharatha to handle their day to day problems. How does the course benefit the scientific approach of students? Based on numerous years of open source software development and teaching experience, 1 Day/2 Days workshops are offered to students on topics such as Introduction to Linux Programming and Open Source Software Development. These workshops give a hands-on experience of the entire software development life cycle and prepare students to become a well-equipped software developer before they graduate. Participants benefit from greater self-confidence and the capability to address real world problems. How many students have you reached till now? The programs, under Anaadi Foundation, have impacted nearly 4,500 students and 300 teachers since June 2015. As a professor with Amrita University, I taught about 1,000 students. Apart from these numbers, I have students visiting my place all the time.